GET MET: The Met: Live in HD series, which began this month at the Cal Poly Performing Arts Center, was made possible through contributions from Greg and Jane Hind of the Hind Foundation. The simulcasts will be broadcasting on a monthly basis (December excluded) through May 2011. The next production is Donizetti’s Don Pasquale on Sunday, Nov. 14, at 2 p.m. General tickets cost $25; students with a valid I.D. pay $10. Series tickets are also available. To buy tickets or check future simulcast times, phone the PAC at 756-2787 or visit pacslo.org. On a crisp Saturday afternoon in New York City, the audience at the Metropolitan Opera is still. They’ve come to see the gods and giants of Wagner’s Das Rheingold sing, swim, and soar across the Met’s massive stage, bodies and disbelief suspended, anything suddenly possible. Intricate full-body harnesses are made imperceptible by clever costuming. But wait! Froh, god of light, has had a slight wardrobe malfunction. A strap of armor is coming apart at the back. Not to worry: His sister Freia, goddess of love, youth, and beauty, slaps the rogue strap back into place. Crisis averted. It’s a trifle lasting nearly no time at all, a thing probably no one filling the Metropolitan Opera’s plush seats noticed. But meanwhile, three hours earlier, a crowd of West Coast opera diehards spotted the split-second rescue in high definition. As part of a series titled “The Met: Live in HD,” the venerated opera house now broadcasts its shows simultaneously to 1,500 theaters around the globe. Cal Poly’s Performing Arts Center now counts itself among this number. The Saturday morning screening of Wagner’s Das Rheingold marked the Central Coast’s first ever Met simulcast, followed closely by Mussorgsky’s Boris Godunov. The next is Donizetti’s Don Pasquale, coming Sunday, Nov. 14. Several people, such as SLO Opera Executive Director Sharon Dobson, contend that the Met Live viewing experience tops the real thing—on some counts. Admittedly, the energy of live (as in really live) theater can’t be replicated. But there’s so much more detail to the simulcasts, as Dobson pointed out. Because the camera is so close to the actors, “you could pick out the subtleties in their movement,” she said, “Like [Reingold's lead character] Wotan’s eyes. You could just see him scheming.” According to Dobson, the Met’s singers have actually improved their acting as a result of the zoom lens to which their work is constantly subjected. The Met has long been the gold standard for opera, its talent culled from all over the world, its budget rivaling that of Hollywood blockbusters (a reported $16 million went into Das Rheingold alone). But suddenly, the immortals of opera are human after all. 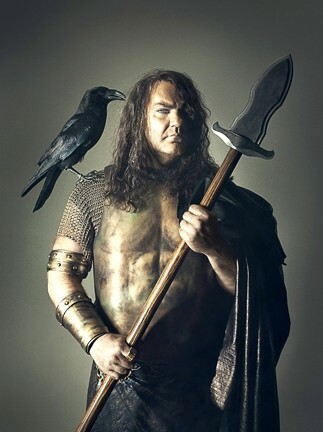 Wagnerian gods, seen in hi-def, reveal not only their skill but also their mortal fallibility to a global audience. It’s like the rest of the performing arts world, while in awe of the Met’s great power, doesn’t have to punish itself for being human. LUNCH WITH DONIZETTI : Donizetti’s Don Pasquale comes to the Performing Arts Center via simulcast in November. SLO Opera director Sharon Dobson said “the Met was really happy” to have the simulcasts on a college campus, recognizing that future audiences rely on a younger generation turning on to opera. Bringing the Met to the PAC was a project several years in the making, said Steve Lerian, director of Cal Poly Arts. After some research, staffers found the simulcasts would require some equipment the PAC didn’t have. “It turned out we would need this insane projector,” Lerian said. Satellite dishes, too. And a 40-foot screen. The “insane projector,” once acquired and installed in the light booth, gave off such incredible heat that a huge venting system needed to be installed. All told, getting the venue simulcast-ready came with a price tag of $90,000, estimated technician Eli Zabala. As with live theater, the simulcasts have a certain element of the unexpected, their quality at the mercy of sun and wind activity. The morning of the Das Rheingold screening was a windy one, Lerian said, causing some initial pixilation and audio distortion. While Wagner’s Rhine maidens likely slipped on their flippers and ran through their vocal exercises in New York, PAC technicians were on the local venue’s roof, worriedly tweaking and moving the satellites around, saying, “Oh, the wind’s not our friend today,” Dobson said. But once the screening got under way, the beauty, splendor, and strife of the three-hour German opera, performed without intermission on a 45-ton moving set known as The Machine, held an audience spellbound. 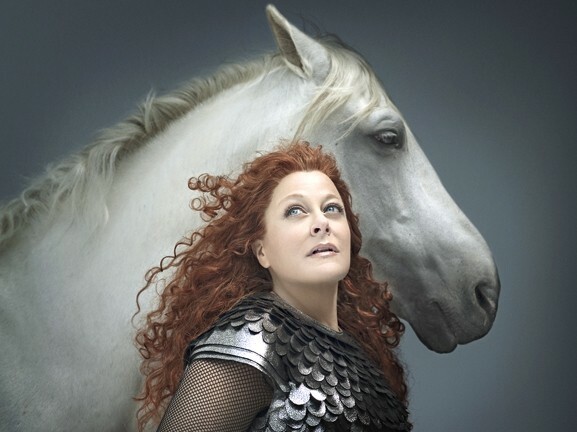 HORSE AND ME : Die Walküre, the next installment in Wagner’s “Ring” series, graces the PAC via simulcast this spring. Thanks to pre-recorded behind-the-scenes clips, the audience was well aware of the full-body harnesses and neoprene suits allowing the performers to swim and fly. (Though you wouldn’t know it from the performances alone, some are afraid of heights. In one scene from rehearsal, a Rhine maiden hesitated to leave the safety of the platform, calling down, “I’m sorry, I’m just so scared!” as director Robert Lepage offered encouragement.) Yet from the first scene on, set at the bottom of the Rhine, mermaids swam with seemingly effortless grace, bubbles issuing from their mouths as they sang tauntingly. While watching the simulcast debut, this writer experienced a reality-warp moment, a trick of perspective, perhaps. For a fraction of a second, the singers seemed to appear in the flesh, climbing out of the screen and stepping onto the physical stage. Then the camera angle changed, and the moment was gone. The goose bumps lingered. Arts Editor Anna Weltner is sure she was a Rheinmaiden in another lifetime. Send flippers to aweltner@newtimesslo.com.